No I haven’t forgotten about the blog……… I was working my way through the Christmas photos for a post, but the unprecedented run of hot weather we have had has resulted in our servers and internet connection being very unreliable. However hot it is outside, it gets even hotter in the garage where our servers live. Even with a fan on them they get hot, really hot, and they don’t seem to like to work when hot! Our photo server died and has only just come back to life (thanks to Anto’s hard work). Everything is backed up so we didn’t lose anything but it’s taken awhile to get everything back online. I’ll work through the photos and get some new ones up this week. Now back to the hot…… when we were in Europe it was mighty cold. People were mentioning 30+ days in only November. After a couple of ‘mild’ summers in a row a hot one was due but it’s turned out to be hotter than we imagined. The last couple of weeks in Sweden and Belgium, trudging through icy winds and snow the thought of a lovely hot day sounded wonderful. Well I think I’m over it now! Our first week back was pretty mild, mid to high 20’s and a couple of days in the low 30s. Oh how the long days of sunshine and warmth were glorious. Not having to rug up every time you go outside. Wearing dresses, shorts and skirts. Getting up in the morning to sunshine and 20 degrees…….. bliss! Well, since then we have had way too many days over 30 degrees. Barely a day under 30 degrees in fact. Since the start of the year it’s been over 35 degrees the majority of the time and we hit 40 degrees a couple of times. I don’t mind the hot but the run of hot weather has been quite long. We normally get a week or so of 35ish weather every summer but it looks like all of January is going to be hot. Our garden is needing a lot of water as along with the hot weather we’ve had hot winds and not a drop of rain. Every night and morning is spent watering just to keep everything alive. The alpacas also hate the heat. Despite being shorn in October, they already have a reasonable fleece cover. We have quite a bit of shade for them so they spend the day moving from one shady spot to another. When it gets too warm for them we put a sprayer on a timer out the back so they can have hourly ‘showers’ to keep them cool……. not that they are spoilt or anything! We have also had bushfires in the region and extreme bushfire danger on several days. Our house is built on block that was razed by the 2003 bushfires and we are in an area prone to fires. This summer is shaping up to be like 2003, but so far so good and no fires to close to our place. We are keeping an eye on nearby fires though as we know at some point in the future there will be another fire in our area. Most areas of Australia have been hot, hot and hotter this summer, so we aren’t alone. We’ve only hit 40 degrees, others have hit the high 40s. The Bureau of meteorology has included new colours on their forecast maps to cope with the possibility of temperatures exceeding 50 degrees. 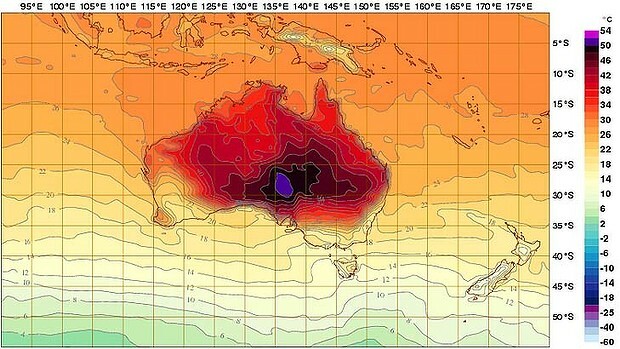 On the 7th of January Australia recorded the hottest national average day on record. Only for the record to be beaten on the 8th of January! Apparently January 2013 has had 7 of the top 20 record temperatures recorded ever. So yes it is very hot….. Lets just hope for some cooler days and some rain in the next couple of weeks. On the upside Astrid has had a ball playing in the her paddling pool in the shade of our umbrella in the afternoons. Air con inside and playing with water outside is a toddlers dream. Posted in blog, blogging, bushfire, hot, summer, weatherBookmark the permalink.